I always advise ladies both married and single to command the respect of their partners financially and otherwise; A lot of times it is a “love enhancer”. Asides that it helps add more value to you as an individual before the man in question. These are personal principles that work for me in this regard. Firstly, as a single lady, don’t join ladies who make financial/material demands from a man who is showing genuine marital interest in them or one who is a likely marriage prospect. Only few guys will take you seriously when you start making demands. Don’t say I was “testing” him. Don’t test* please. These actions paint you in a very wrong light. You send the signal that you are materialistic and very likely, a burden. There are many ways to know if a man can meet your needs and that of the home he is planning on starting. There are ways to know whether a man will be generous towards you. If he loves you enough, he will give to you without you having to ask. Now to married ladies; please at every point in time don’t be without a source of income to support your man and family except it is with mutual consent (which I believe should last only for a while). In addition, learn to multiply income for your family. Don’t be wasteful. Wasteful in this context is relative, so whatever is wasteful per your family size of income, avoid it. 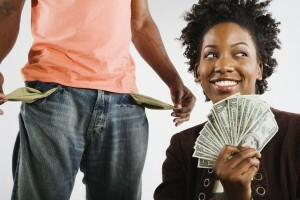 Don’t be a woman who squanders her man’s wealth just because it is available. If you and your spouse keep separate accounts, what you would not ordinarily buy with your own hard earned money don’t waste your man’s money buying it (you don’t need to agree with me 🙂 ) Sometimes, when your husband insists on some unnecessary* luxurious spending on you, object. Not because you are pretending but because it’s the right thing to do. Thirdly, let your love for your man go beyond the monetary or material benefits you get from him. That is to say, if your partner is stripped of every form of financial and material wealth he currently posses, would you still love him? This is a question you need to answer before marriage, if you did not answer this question before you said “I do”, start working towards loving your man beyond the material benefits. I’ve seen and heard of ladies who leave Mr “A” even though they truly love him and chose to marry Mr “B” simply because at present Mr “B” can fund a big wedding, he can pay for their choice home, he drives the ideal kind of car etc. As funny as this sounds, it’s happening and as a matter of fact becoming more rampant as the days go by. I follow several groups on social media and I frequently read stories where a lady is seeking advice/help from other ladies because, she is trapped with Mr “B” who she chose out of greed/material convenience but has her heart for some other guy (Mr A) who she believes she truly loves. Talk about reasons for divorce these days…it’s one of it. Finally dear ladies, marry the man you truly love and the one who truly loves you. My previous write up titled “Love is not cheap” was centered on encouraging our men to spoil their wives and fiancées with gifts, money and other material things, this write up ” Ladies, Love and Benefits” however encourages ladies to earn their partners love and respect in more honorable ways than for the availability of material possessions. Don’t base your love on material benefits neither should you let any man determine your value by such.